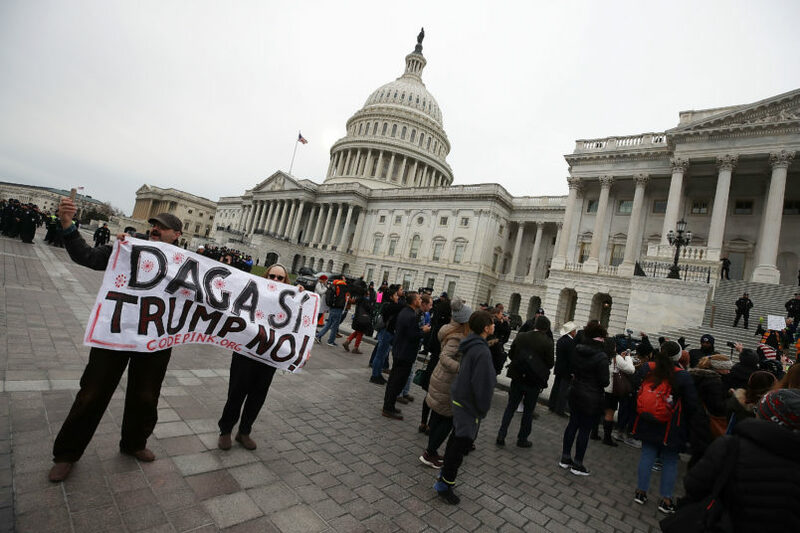 With that threat looming, many Democrats in the House and Senate called on their colleagues to block the budget bill’s passage, threatening a longer-than-eight-hours government shutdown in the hopes of pressuring Republican leaders to bring a bipartisan DACA bill up for a vote. But enough Democrats broke ranks and voted for the bill to send it to the White House for Trump’s signature, leaving no other must-pass piece of legislation on the table before the program expires. When the Senate failed to pass a short-term budget a couple of weeks ago, triggering a multi-day government shutdown, Democrats who opposed the bill argued that their vote was not simply over DACA, but also in protest of a lack of funding for Community Health Centers, disaster relief for Puerto Rico, and funding to address the opioid crisis. In this most recent bill, all of Democrats’ demands except DACA were met, turning up the political pressure. House Minority Leader Nancy Pelosi (D-CA) attempted to thread the needle by personally vowing to vote no, by urging her colleagues to vote no, and by giving the longest House floor speech in more than 100 years demanding Republicans allow a fair, bipartisan DACA debate. But House members conceded to TPM that Pelosi’s team did not significantly pressure Democrats to hold the line, as they did on the tax bill and the Obamacare repeal bill. After more than 70 House Democrats voted to pass the budget, DACA recipients and their allies were furious. The last government shutdown extracted from Senate Majority Leader Mitch McConnell (R-KY) a promise to open up the Senate floor for a debate on DACA this week, in which Democrats and Republicans would be able to propose amendments. Some House members believed that blocking this latest spending bill in the House could extract a similar concession from Speaker Paul Ryan (R-WI), who is currently refusing to hold a vote on any immigration bill that doesn’t already have President Trump’s backing. But some Democrats, including House Budget Committee ranking member Rep. John Yarmuth (D-KY), said that strategy would have hurt the party politically while achieving nothing. Yarmuth was a member of the ill-fated “Gang of Eight” immigration reform effort in 2013, which saw the Senate pass a bill to give millions of undocumented immigrants a path to citizenship only to have the effort die in the House without so much as a vote. Yarmuth acknowledged that history could very well repeat itself in the coming weeks. Having voted to raise the debt ceiling, lift the sequester caps, and keep the government’s lights on, Democrats have no real means left of pressuring Republicans to hold a vote. Nearly a dozen meetings between House and Senate leaders in both parties have gone nowhere, and while a large bipartisan group of rank-and-file senators insist they’re making progress on an immigration agreement, they have yet to rally around any one piece of legislation. It’s not clear what provisions, if any, can clear 60 votes. Already, in anticipation of the failure to agree on a permanent solution for DACA recipients, senators are drafting legislative text that would give them temporary protection paired with a couple years of funding for the U.S.-Mexico border. Whether even that short-term, bare bones policy could pass the House is unclear, with GOP leaders insisting on only voting on bills President Trump supports, and the White House continuing to demand controversial cuts to legal, family-based immigration. Yet even after watching a string of immigration reform efforts fail before reaching the President’s desk over the past few years, Yarmuth’s hope springs eternal. How impossible the deportations will be for a party that for years has campaigned on the threat of undocumented immigrants, and an administration that paints them as alternately lazy, criminal, and capable of terrorism, remains to be seen.